...have gathered for a Poker night and to share stories about the time they nearly dispensed with that troublesome Caped Crusader, Batman. Little do they know that the Dark Knight is in their midst, disguised as one of their own. Will the rogues be able to suss out the bat in their belfry before he clandestinely subdues them? 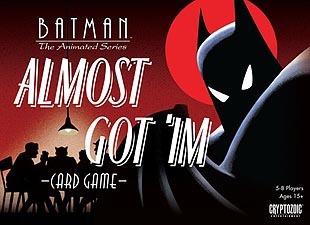 This unique variant on the popular Werewolf-style social deduction game, inspired by the memorable Batman: The Animated Series episode "Almost Got 'Im", adds a Poker element to the proceedings, requiring participants to craft Poker hands to activate their special abilities when the lights go out. Take on the personas of classic Batman villains in a game in which everyone has something to hide and absolutely no one is safe!